Providing you the best range of wire mesh with eyelets for cement plant with effective & timely delivery. With the help of our advancement in technology, we are providing an exclusive range of Wire Mesh with Eyelets for Cement Plant in the market. We believe in customer satisfaction so we finely processed our entire products range and offer it in affordable prices to our customers. This Wire Mesh with Eyelets for Cement Plant is available in specifications as per the specific demands of our valuable customers. We provide customized packaging to our products at the time of delivery. 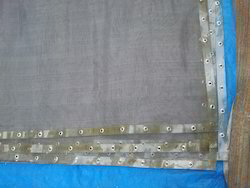 Looking for Wire Mesh with Eyelets for Cement Plant ?